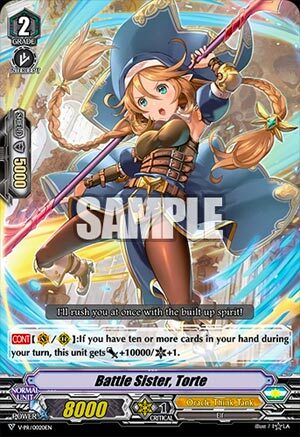 [CONT](VC/RC):If you have ten or more cards in your hand during your turn, this unit gets [Power]+10000/[Critical]+1. I’m sorry guys. We don’t get to review interesting cards until the 15th, when the Sneak Peek’s over with. So just bear with me and let’s look at some promos. …and my word are they underwhelming. This one I sort of like a little more, but in all honesty, while the 10k plus Crit is nice for pressure, you’d have to dedicate the ENTIRE build around her: you don’t just splash a glass cannon that can be picked off by a Grade 1 for the lulz and expect good results. The OTT deck would need to draw constantly to make this happen. Run at 4 and make it all about her, or don’t use. There’s no middle ground.